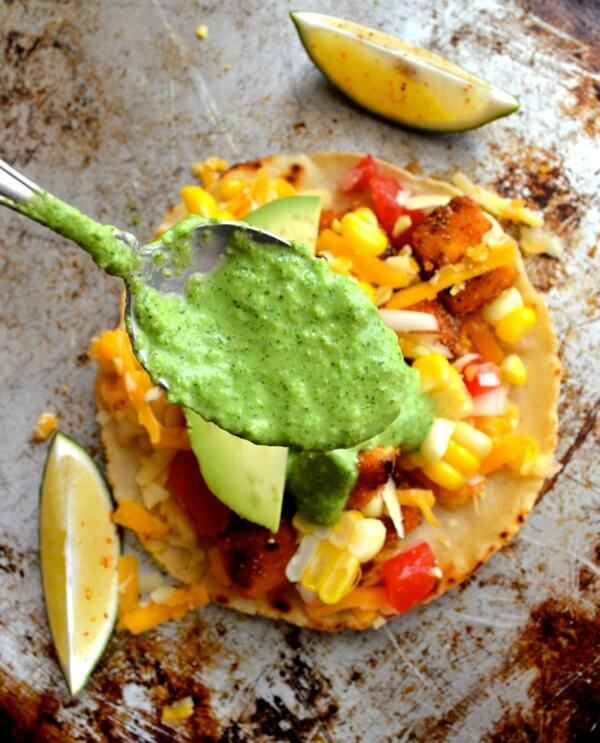 These crispy tofu tacos may sound weird but after you experience this ultimate vegetarian taco with our scallion cilantro sauce, these crispy tofu tacos may sway you to the vegetarian side! Cut the tofu into ¾ inch cubes. In a wide, shallow bowl, combine the Sriracha and honey, and gently toss the tofu in the mixture. In another wide, shallow bowl, combine the cornmeal, chili powder, cumin, salt, garlic powder, and pepper. Toss the tofu in this dry mixture until well-coated. In a cast iron or non-stick skillet, heat the oil over medium high heat. Add the tofu and allow the pieces to crisp up on all sides. While that's happening, whizz up the scallions, cilantro, and yogurt in a food processor or blender. Build your tacos with tortillas, your sauce, and whatever toppings you like.